Traffic backed up on the George Washington Bridge in both directions for hours. Two tractor-trailers crashed into each other on the George Washington Bridge Wednesday morning. 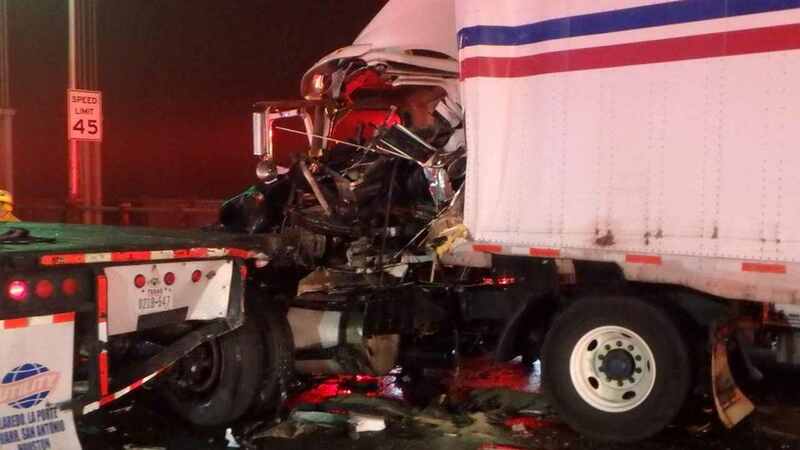 The front end of a Rite Aid tractor-trailer rear-ended a flatbed tractor-trailer around 3:30 a.m. on the westbound upper level. The two drivers were injured and taken to Englewood Hospital with non-life threatening injuries. Port Authority Police issued a summons to the 46-year-old male driver of the flatbed tractor/trailer for "stopping on the roadway." He is from Fresno, Texas. A summons also was issued to the 57-year-old Rite Aid truck driver, from Levittown, Pa., for "imprudent speed." His truck is registered to DK Transit. All New Jersey-bound upper level lanes were closed for the investigation. Traffic was backed up on the upper level in both directions for hours. Cars were diverted to the westbound lower level. There was also a fuel spill due to the accident that had to be cleaned.